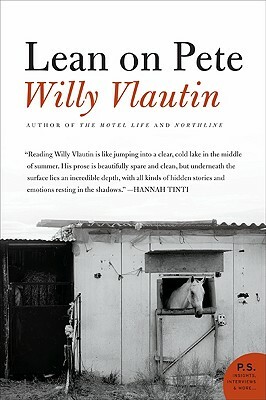 Willy Vlautin’s award-winning novel Lean on Pete, a moving and compassionate story about a fifteen-year old-boy's unlikely connection to a failing racehorse as he struggles to find a place to call home—now a major motion picture from A24, the studio behind Moonlight and Lady Bird, starring Charlie Plummer, Chloë Sevigny, with Travis Fimmel and Steve Buscemi, and directed by Andrew Haigh (45 Years, Looking). Fifteen-year-old Charley Thompson wants a home, food on the table, and a high school he can attend for more than part of a year. But as the son of a single father working in warehouses across the Pacific Northwest, Charley's been pretty much on his own. When tragic events leave him homeless weeks after their move to Portland, Oregon, Charley seeks refuge in the tack room of a run-down horse track. Charley's only comforts are his friendship with a failing racehorse named Lean on Pete and a photograph of his only known relative. In an increasingly desperate circumstance, Charley will head east, hoping to find his aunt who had once lived a thousand miles away in Wyoming—but the journey to find her will be a perilous one.